The Quiltzette: Flannel 30% Off! Please join me in welcoming Aimee King to our staff. Aimee took Beginning Quilting here about a year ago and many of you have been classes with her since then. She lives in Mancos with her husband Todd and their two teenagers, Nolan and Cassidy. 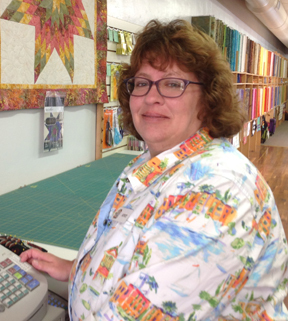 Aimee is a wonderful asset to our team and I could not be more thrilled to have her here full-time at Cortez Quilt Company. Spring Is Here . . . Flannel Must Go! What's left of this beautiful flannel collection is 30% off until it's all gone. Hurry in today! 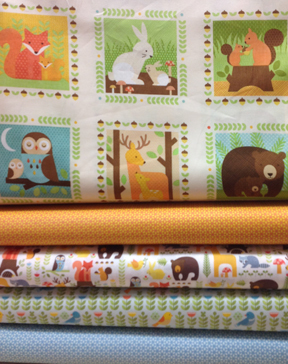 This cute mom-and-baby-animal collection arrived last week. 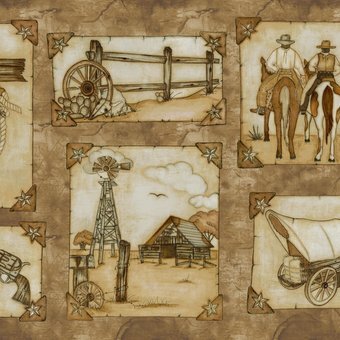 Perfect for a quilt or wall hanging for both girls and boys. 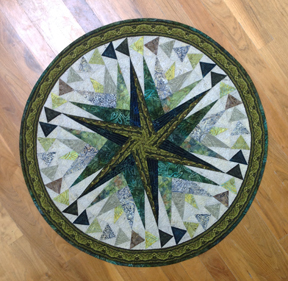 Whether you’re experienced at paper piecing or are ready to learn, this project is sure to inspire. At 31″ in diameter it can be used as a table topper or wall hanging. We have the kits in four different colorways. Judy Bryan will teach this class. Call today . . . only two spaces left in this class! 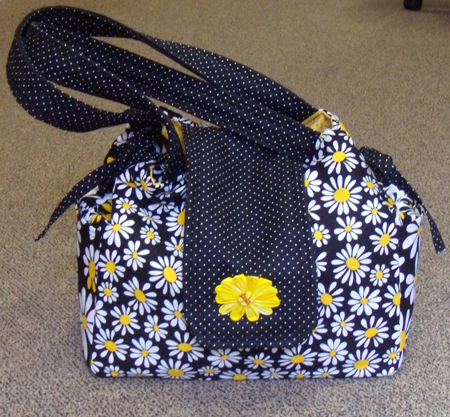 Guest teacher Ila Starks has made so many of these great totes that we’ve taken to calling it the “Ila Bag” around here! This large, functional, and fun-to-make tote is perfect as an overnight or travel carry-on bag, diaper bag, or just as a nice, large purse. Sign up for this two-day class now. It’s limited to eight students. At the end of January when the UFO Challenge registration closed we had 420 projects submitted by 63 people. To date, we've seen 83 completed UFOs. That's about 20%. Good job everyone! 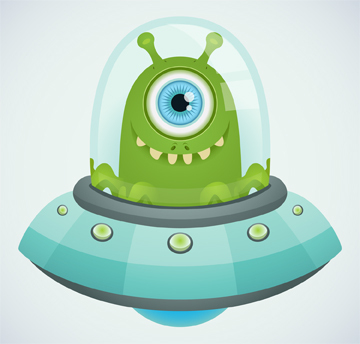 Remember, you have until May 26 to bring in your completed UFOs to be entered to win one of FIVE $100 gift certificates to the shop. Have fun sewing! 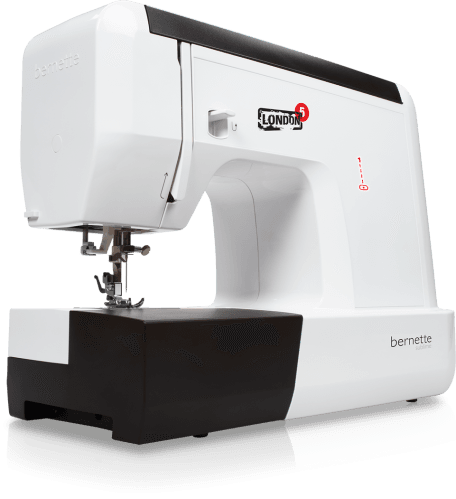 We are making room for some new BERNINA sewing machine models (including the fabulous Q20 mid-arm quilting machine that's coming this summer - we can't wait!) so we're doing a quick clearance sale on the Bernette London 5 machines that we have in stock. This is a great machine for a beginning quilter/sewist or as a second machine to travel with - it's lightweight! The London 5 features 28 stitch patterns, easy stitch selection, six presser feet, a built-in needle threader, one-step buttonhole maker, and a flip-top lid and dust cover. The MSRP on the London 5 is $499. PLEASE COME BY THE STORE FOR THE SALE PRICE. Limited to stock on hand. P. S. This would make a wonderful graduation gift so get your shopping done early for that special teen on his or her way to college! This week's tip is from Cindy Dahl. Stitch seam to the end of the fabric. 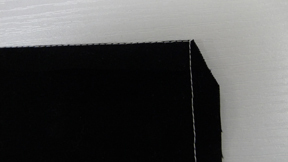 Fold on the line you just stitched and press the seam allowance towards the center of the item. It's a little hard to see in this image, but Cindy has folded the seam down toward her. Start stitching the next seam at the folded edge. Trim the corners at an angle to reduce bulk. Turn and press. 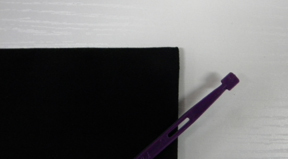 "The Purple Thang" tool shown here ($3.99) is wonderful for pushing the corner out. 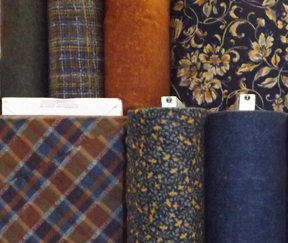 This panel and companion fabric sold out faster than anything we've ever had at the store. Fortunately, we were able to re-order the collection. If you're interested in making a quilt with this fabric please come in as SOON as you see it posted in the newsletter again (hopefully by next week). Here's the free pattern for the project from the fabric company, or create something fun from the best-selling Panel Play book that we keep in stock.